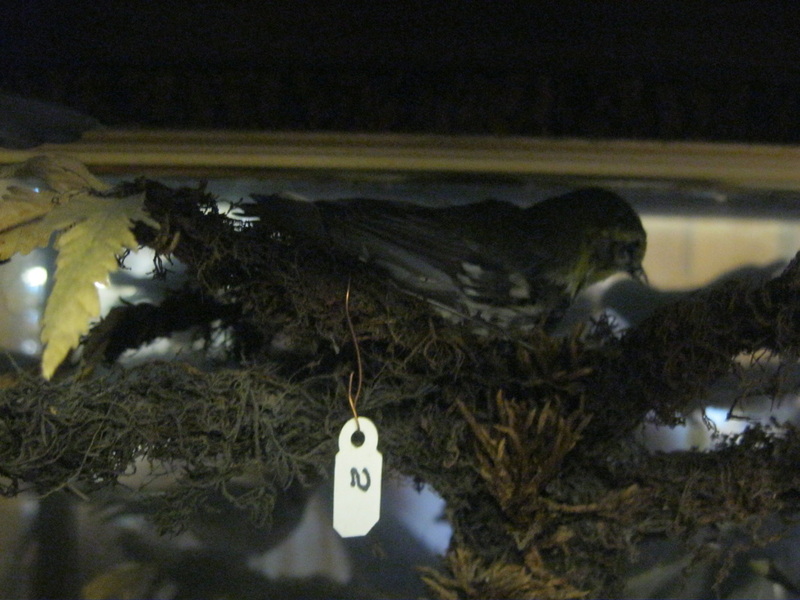 Case 9, home to 20 birds, is situated to the left of the fireplace on the left side of the window. Next to the filling cabinet that case 7 is on. 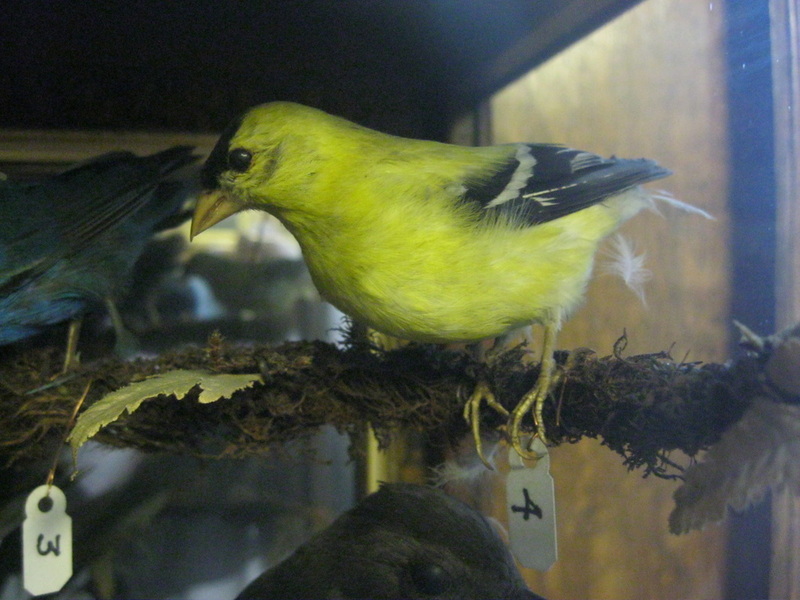 The American Goldfinch undergoes a molt in the spring and autumn. 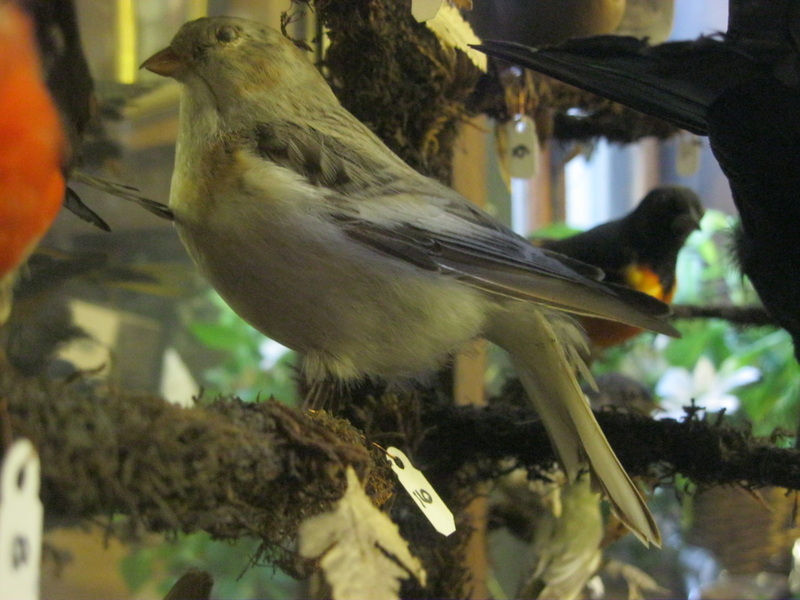 It is the only cardueline finch to undergo a molt twice a year. 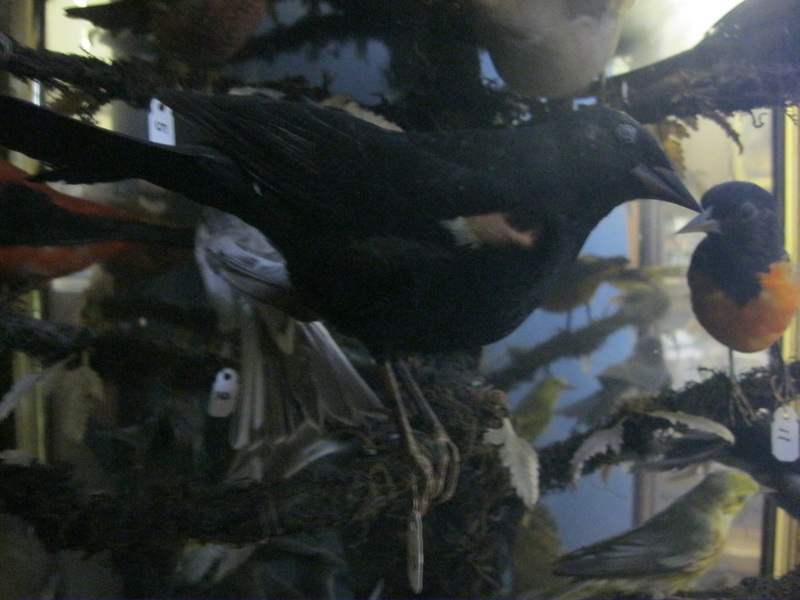 During the winter molt it sheds all its feathers; in the spring, it sheds all but the wing and tail feathers, which are a dark brown in the female and a black in the male. 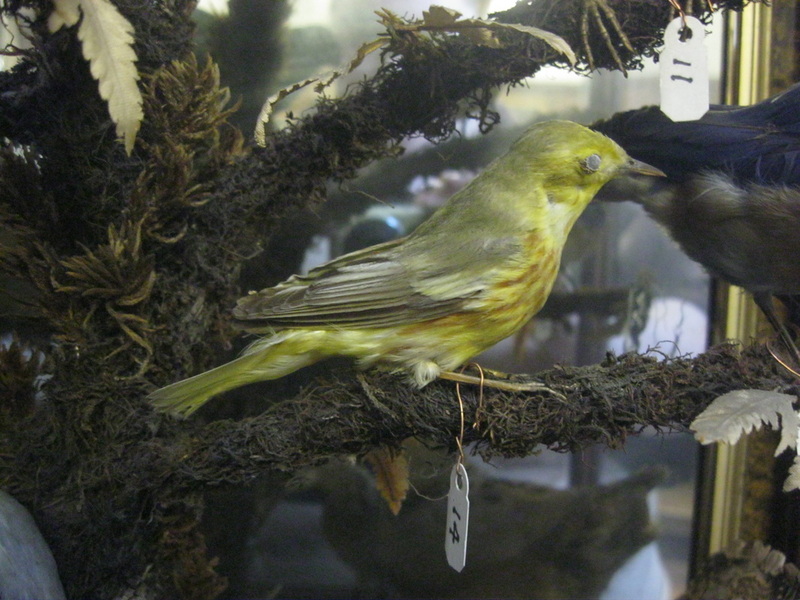 Once the spring molt is complete, the body of the male is a brilliant lemon yellow, a color produced by carotenoid pigments from the plant materials in its diet, with a striking jet black cap and white rump that is visible during flight. 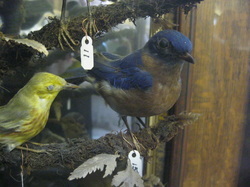 The American Goldfinch is a diurnal feeder. it is mainly granicorous, but will occasionally eat insects, which are also fed to annual plants, often those of weeds grasses and trees, such as thistle, teasel, dandelion, ragweed, mullein, cosmos, goatsbeard, sunflower, and alder. 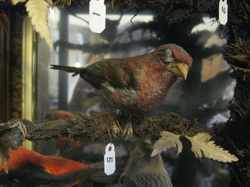 The Purple Finch is one of 24 birds in the genus Carpodacus and is included in the finch family, Fringillidae, which is made up of passerine birds found in northern hemisphere and Africa. 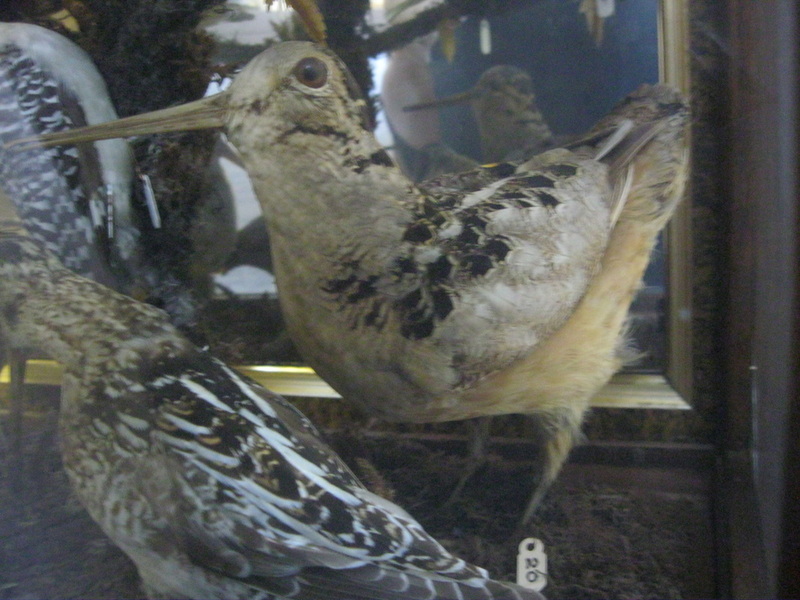 Their breeding habitat is coniferous and mixed forest in Canada and the northeastern United states, as well as various wooded areas along the U.S. Pacific cost. They nest on a horizontal branch or in a fork of a tree. 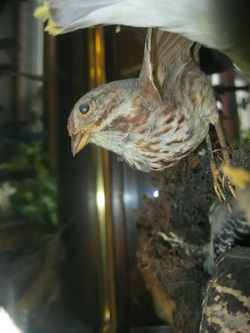 The Purple Finch population had declined sharply in the East due to the House Finch. Most of the time, when these two species collide, the House Finch out competes the Purple Finch. This bird has been also displaced form some habitat by the introduced House Sparrow. 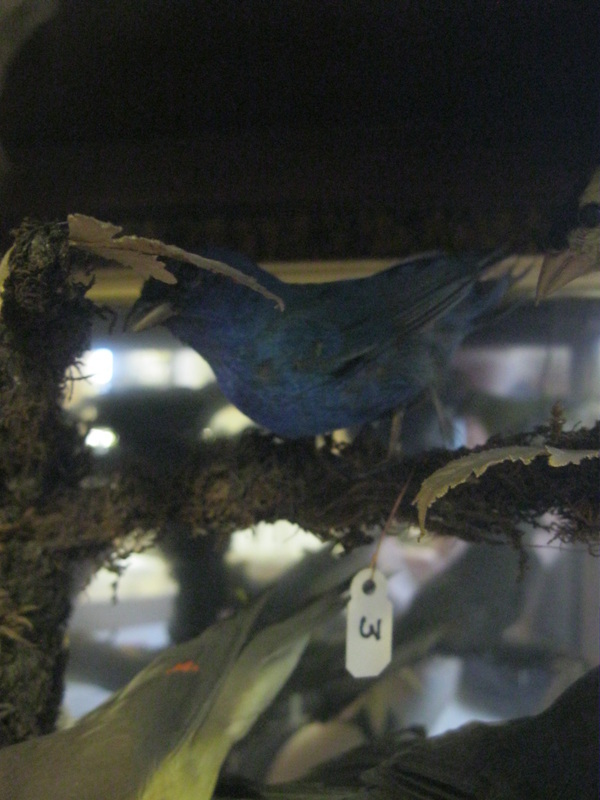 These birds forage in trees and bushes, sometimes in ground vegetation. 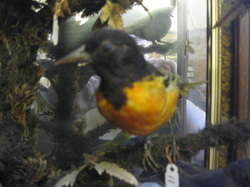 They mainly eat seeds, berries, and insects. They are fond of sunflower seeds, millet, thistle. 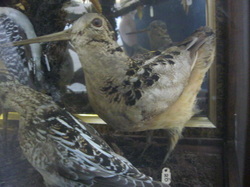 This is the state bird of New Hampshire. The Gray Catbird (Dumetella carolinensis), is a medium-sized northern American perching bird of the mimid family. This species is named for its cat-like call. Like many members of the Mimidae (most famously mockingbirds), it also mimics the songs of other birds, as well as those of Hylidae (tree frogs), and even mechanical sounds. 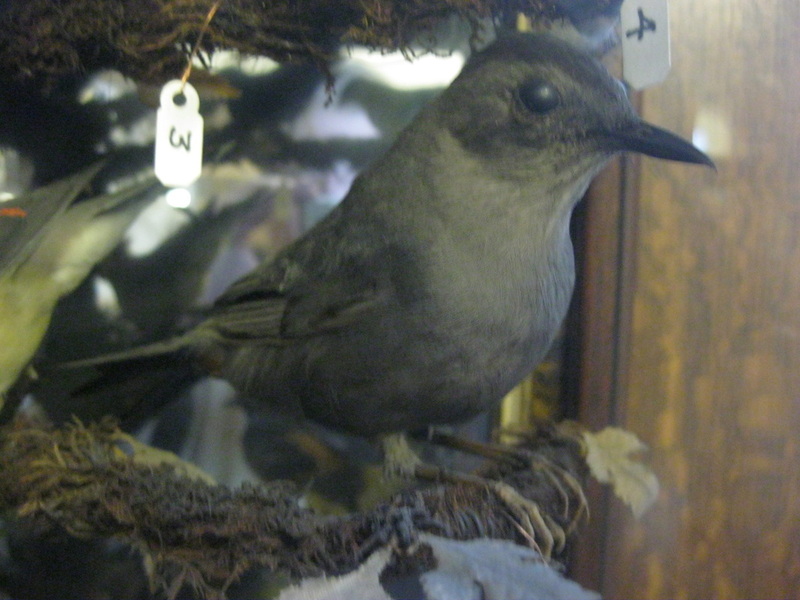 In contrast to the many songbirds that choose a prominent perch from which to sing, the catbird often elects to sing from inside a bush or small tree, where it is obscured from view by the foliage. Their breeding habitat is semi-open areas with dense, low growth; they are also found in urban, suburban, and rural habitats. In the winter quarters they actually seem to associate with humans even more. 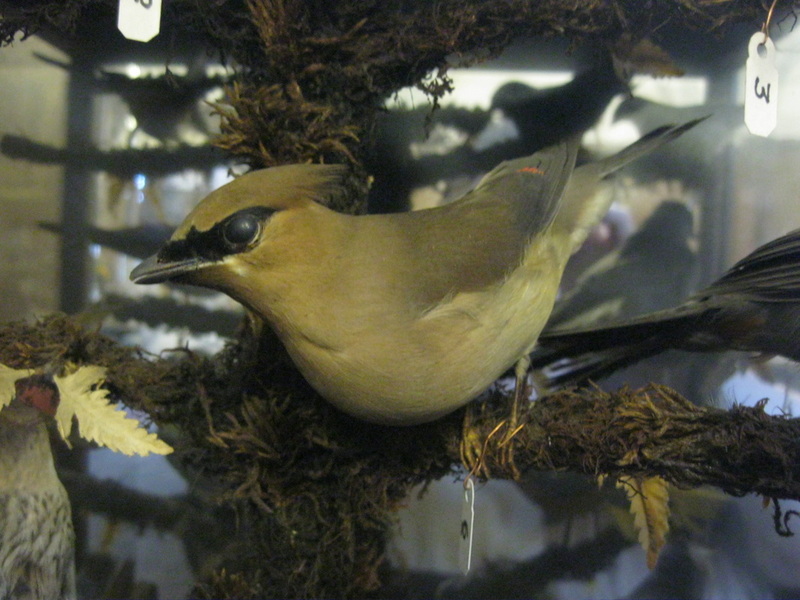 These birds mainly forage on the ground in leaf litter, but also in shrubs and trees. 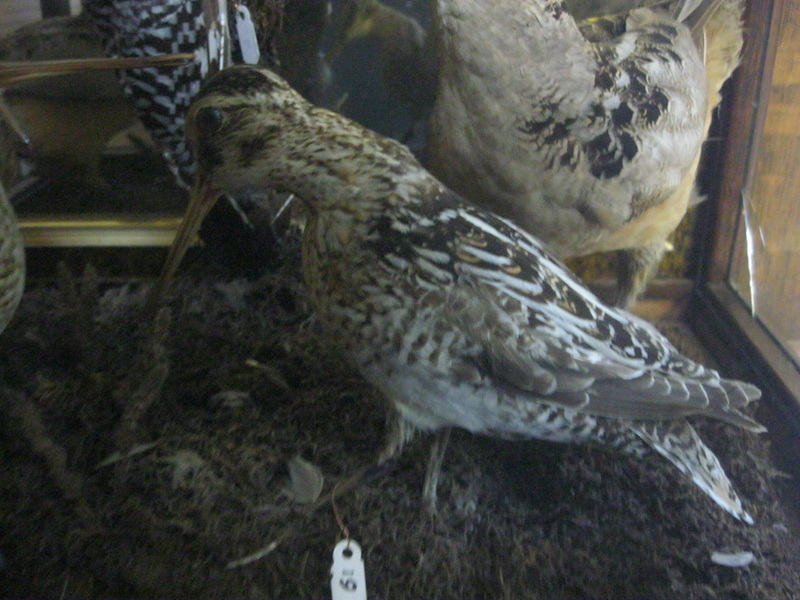 They mainly eat arthropods and berries. They build a bulky cup nest in a shrub or tree, close to the ground. Eggs are light blue in color, and clutch size ranges from 1 - 5, with 2 -3 eggs most common. Both parents take turns feeding the young birds. This species is widespread and generally plentiful, though its reclusive habits often make it seem less common than it actually is. The Scarlet Tanager (Piranga olicacea) is a medium-sized American songbird. Adults have pale stout smooth bills. 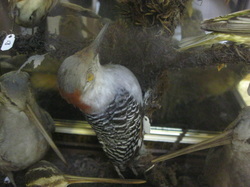 Adult males are bright red with black wings and tail; females are yellowish on the underpants and olive on top, with olive-brown wings and tail. 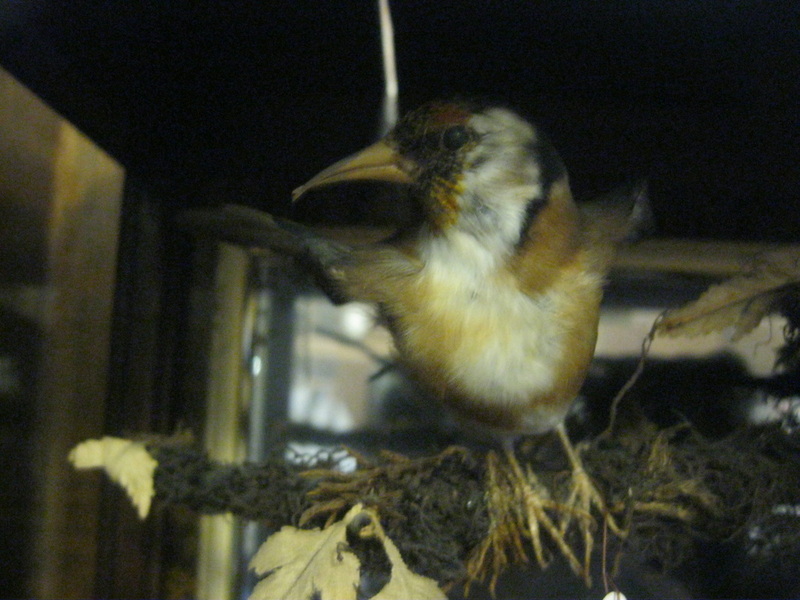 Their breeding habitat is large forested areas, especially with oaks, across eastern North America. 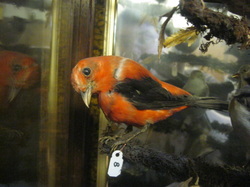 Scarlet Tanagers migrate to northwestern South America, passing through Central America around April, and again around October. Scarlet Tanagers are often out of sight, foraging high in trees, sometimes flying out to catch insects in flight. They eat mainly insects and fruit. 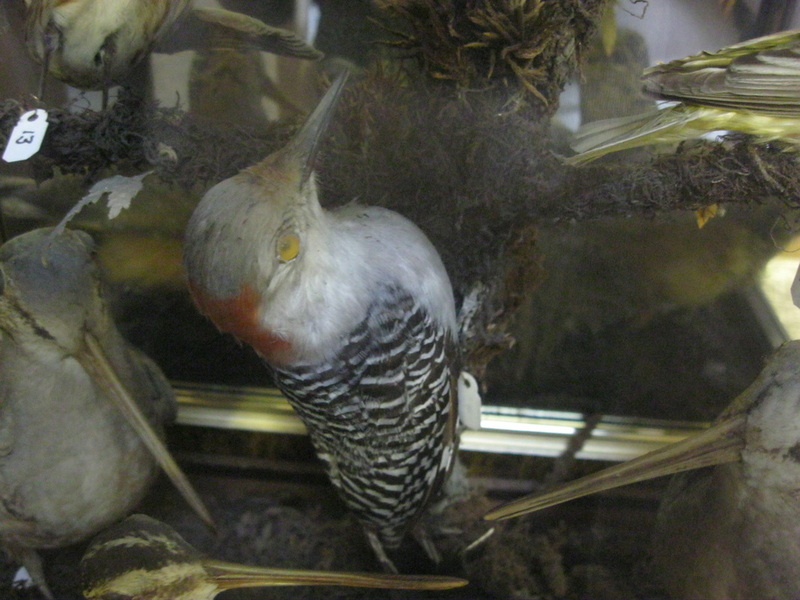 Their nests are typically built on horizontal tree branches. Specifically their numbers are declining in some areas due to habitat fragmentation, but on a global scale tanagers are a plentiful species. 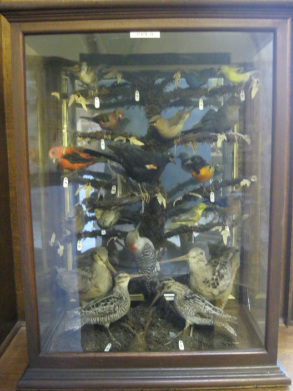 Please Help Us Identify these birds by going to our Unidentified Birds Page and filling out the form and come down and see the birds for yourself. 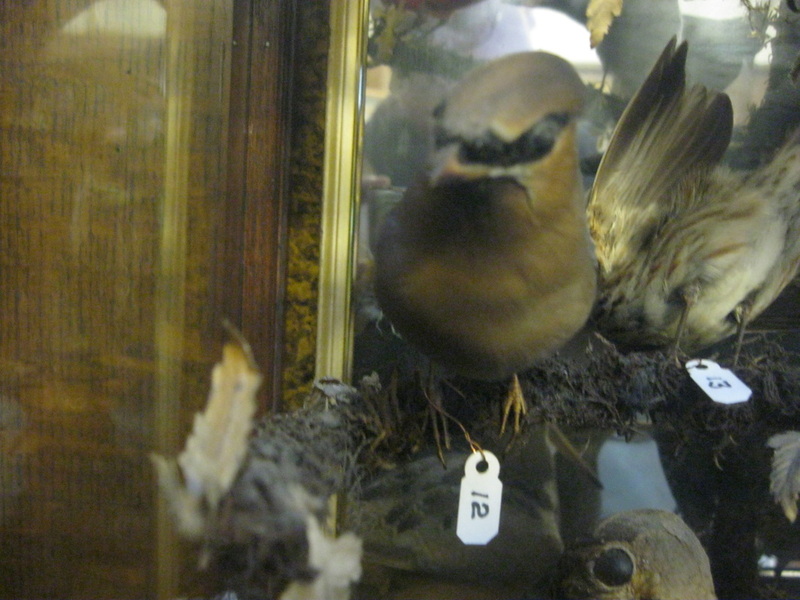 Are any of these birds incorrectly identified? 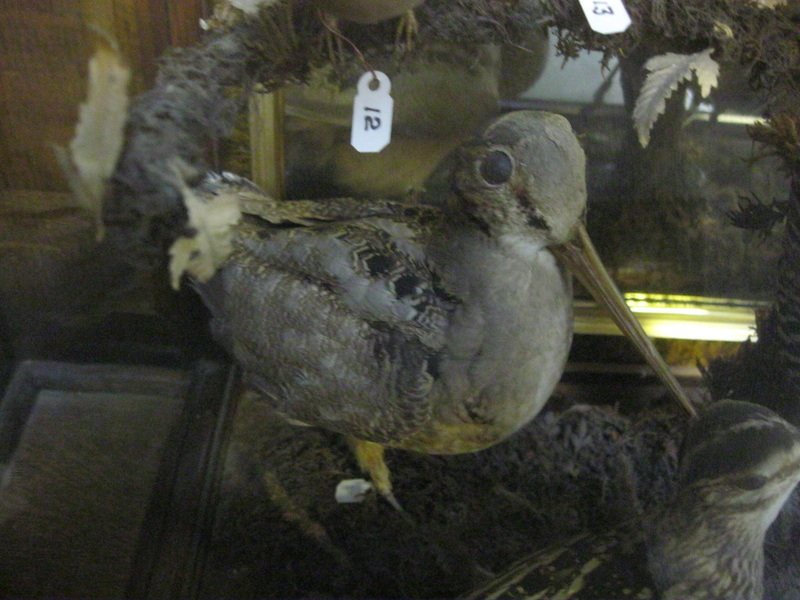 Let us know by going to our Unidentified Birds Page and telling us. 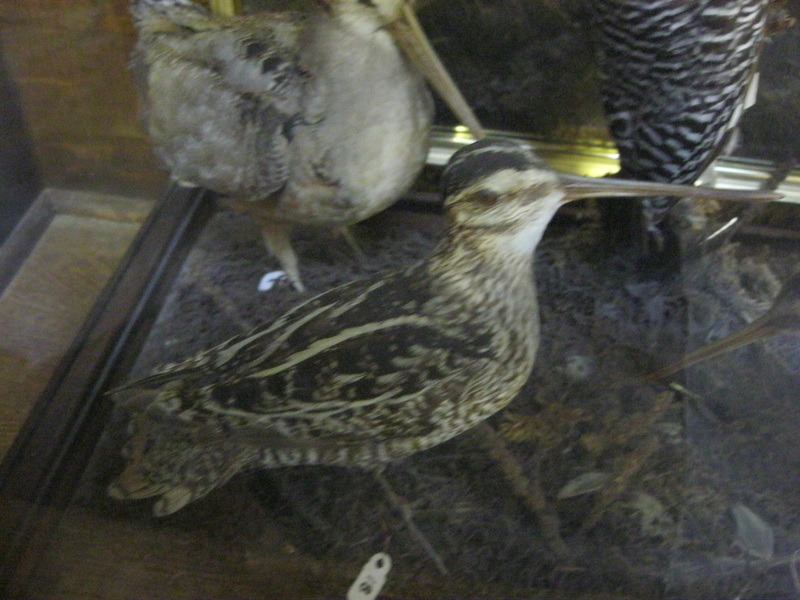 Or Help Identify the birds we don't know.